Smiling John. 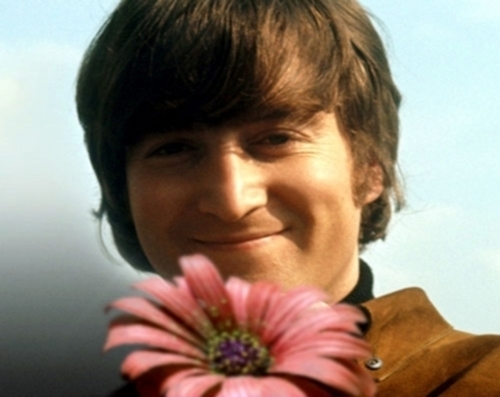 John with a flower. Doesn´t he grin sweet?. Wallpaper and background images in the John Lennon club tagged: john. This John Lennon photo contains 일반적인 해바라기, 미라 솔, 해바라기, helianthus annuus, 마르티니크, 해바라기 초, 해바라기, helianthus, 블랙 아이드 수잔, 중 rudbeckia의 hirta, 중 rudbeckia의 serotina, 검은 눈동자 수잔, rudbeckia hirta, and rudbeckia serotina. There might also be 부케, 코사지, 꽃다발, posy, nosegay, 코 사지, 고슴도치 선인장, 거대한 해바라기, 키 큰 해바라기, 인도 감자, helianthus의 giganteus, 자이언트 해바라기, 헬리 서스 기가 네스, 거 대 한 해바라기, and 해바라기 giganteus.